A Great Hunger commemoration walk led by Damien Dempsey will proceed from the Garden of Remembrance to Glasnevin Cemetery on Saturday, 27 August, at 2:00 PM. The theme of the walk is “Gan Bia, Gan Beal, Gan Ainm” (Without Food, Without Voice, Without Name) and is being sponsored by Afri. Glasnevin Cemetery has the largest mass grave in Ireland, with tens of thousands of victims of Ireland’s Great Hunger interred. Names of all Famine victims have been kept in the Glasnevin registry, highly unusual for Famine mass burials. 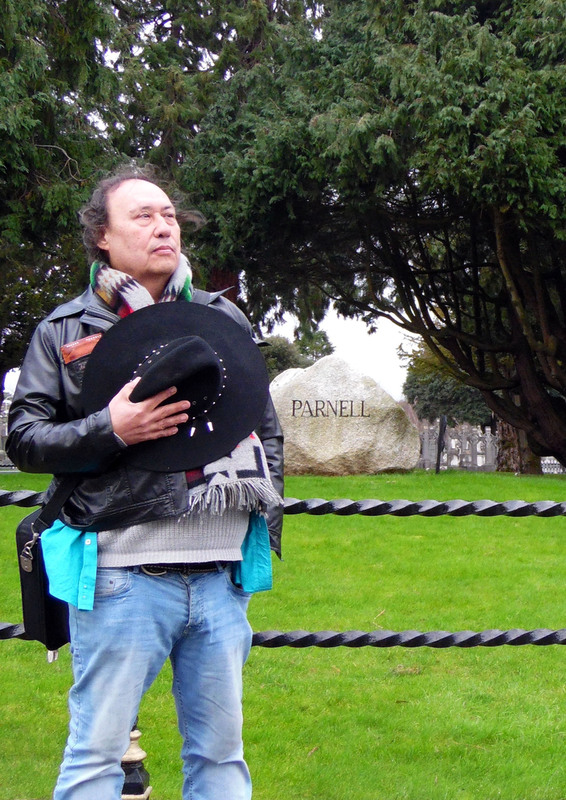 “Through remembering, healing happens” said walk organiser Choctaw Gary White Deer. In 1847, the Choctaw donated monies for Irish Famine relief. “It’s our duty to pass on the true history, brutal and beautiful, to the children, and they might see they have more in common than they thought with less fortunate people around the world now” Damien Dempsey said. “Everyone is very welcome to come along” he added. Other walk leaders include: Choctaw Gary White Deer, musician RoJ, and Justine Nantale (Uganda).